Today's entry in Exclaim! Holiday Gift Guide series is what it comes down to for Exclaim! readers: music. Of course, your favourite artists are putting out albums all year, but it's around now that they start looking back, digging into the archives, and re-releasing classic albums and song collections in deluxe box sets that reflect the ongoing relevance of their art. Whether you think it's a cash grab or not, the music lover on your list is relying on you to grab that gift box while it's still available — these tomes aren't easy to make, and most don't stay on shelves forever. There's a joke in Men In Black about everyone buying The White Album again. It was meant to presage new technologies that require constant audio upgrades, but the joke's on them — or is it on us? Turns out, the best way to experience the Beatles was the way it happened the first time: on vinyl, with big art, liner notes and gatefold sleeves. And thus, after the mono and stereo remasters project of 2009, the Beatles catalogue comes full circle with this 16-album, 180-gram vinyl behemoth (pictured above). All 14 UK studio albums, plus the U.S.-inspired Magical Mystery Tour and the B-sides and singles collection Past Masters, arrive with a thump on everyone's holiday doorstep. While the band's future remains up in the air, fans can satiate themselves with this ridiculously packed box, named in honour of the band celebrating their 21st anniversary since their debut album, Leisure. Depending on which version you're after, the box includes all seven of the English band's albums with bonus discs, four rarities discs, three DVDs and a seven-inch. Only available in Europe and packed with all mod cons, the four-disc super deluxe version of the Jam's final LP tacks on the group's final singles to the remastered album, a live disc, DVD, 72-page book, postcards and a replica tour program. Recalling the brief period where the Staten Island MCs made chess as integral a part of hip-hop culture as martial arts films, this stone cold classic features the original, ground-breaking album, a second disc of instrumentals, new liner notes and a wooden chess set that can be played on the inside cover of the box. Wu-Tang Clan were still riding their initial wave of success when Raekwon dropped this 1995 debut, and it still stands as one of the hip-hop collective's crowning achievements. This "Purple Tape" reissue pays homage to the record's original run of cassettes that came in a clear purple plastic. Raekwon has said it was a nod to the way drug dealers would brand their product by differentiating it from the competition. The reissue package includes a hardcover book, a poster and sticker all housed in a black lacquer box. The set is apparently sold out, so start your online hunting now. Upon its initial release, Twice Removed tanked spectacularly stateside, costing the band their record deal. Eighteen years later, it's regularly heralded as one of the greatest Canadian albums of all time. This deluxe reissue includes the original album, demos and outtakes on vinyl, a seven-inch, a 32-page book and a replica of the original fan letter to Kurt Cobain the band swiped from the Geffen offices that inspired the track "Penpals." Not to be confused with Criterion's recent release of the film with the same name, this reissue packs everything a modish Who fan could want: a remastered version of the band's second concept album, two discs of demos and outtakes and eight of the album's original tracks presented in 5.1 surround sound for the obsessive audiophiles, not to mention the requisite hardcover book full with notes, photos and essays. Prolific to a fault, keeping up with Madlib is a serious commitment. Thankfully Stones Throw assembled this collection of the 13 records the L.A. DJ, producer and MC did under the name Madlib Medicine Show. Conceived as showcases for his production and DJ mixing skills, the series was originally meant to be an album-per-month series, but took twice as long. The Brick contains all 13 editions with their original cover art and booklets. Johnny Cash recorded approximately one bazillion albums over his 50-year career, much of it for Columbia, who assembled this massive 63-disc set. Many of the 59 albums for Columbia are available for the first time on CD here. Rounding this out are two compilations: one of Cash's non-album Columbia singles and the other a set of material from his Sun Records years. For their 40th anniversary, British rockers Queen are issuing a series of box sets (pictured above) featuring remastered editions of their landmark records. The bonus for fans is a second disc of rarities included with each. Word is these boxes are almost sold out so if you see one, be sure to pick it up. Volume I includes the band's self-titled debut, II, Sheer Heart Attack, A Night at the Opera and A Day at the Races. Volume II packs News of the World, Jazz, The Game, Flash Gordon and Hot Space together, because every obsessive needs an expanded edition of the Flash Gordon soundtrack. One of the most influential musicians of the last 40 years and a beloved political activist in Nigeria, Fela Kuti's popularity is at an all-time high thanks to a Broadway musical based on his life. Knitting Factory Records recently reissued the Afrobeat pioneer's extensive back catalogue, along with offering up a pair of vinyl box sets. The first set of six albums was compiled by Roots beat-keeper Questlove, the second by Cream and Blind Faith drummer Ginger Baker. The Baker-curated set includes a 12-page booklet and poster. Featuring pop hits backed by African-influenced music unfamiliar to the Western audiences that embraced it, Graceland was both an artistic and commercial triumph upon its release a quarter-century ago. This set includes a pair of DVDs; one featuring the 1987 African Concert in Zimbabwe and the Under African Skies doc as well as an 80-page book, audio doc and five bonus cuts. True to their anti-capitalist ethos, Rage Against the Machine have been loathe to cash in on their past, even as the band continue to play reunion gigs and tease the possibility of a new album. But when it came to the 20th anniversary of their self-titled debut, they (or their label) couldn't help themselves. The box set edition comes with a remastered album with three bonus tracks, their original 1991 demo, a DVD of their free 2010 Finsbury Park concert and their 1997 VHS compilation. Audiophiles have met their match. The latest EP from Baltimore-based knob twiddlers Matmos is meant to replicate the Ganzfeld Experiments, a test for telepathy. The EP includes a pair of Incase sonic headphones and a pair of goggles to "facilitate the recreation of the exact perceptual circumstances" of the original Ganzfeld test subjects. Martin Scorsese's George Harrison doc Living in the Material World quickly became one of the go-to documents on one of this century's most influential, enigmatic and well-documented musicians. 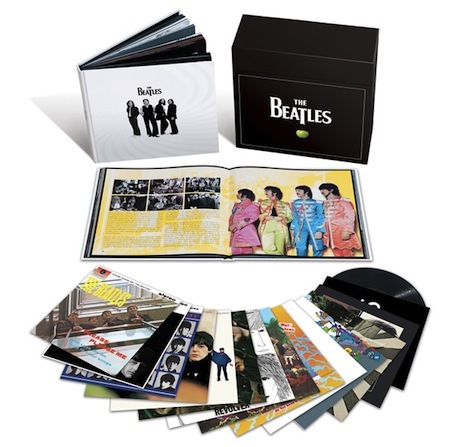 This package includes the two-disc Blu-ray released earlier this year and pairs it with a 96-page book and the 10-track demos and outtakes CD Early Takes Volume 1, filled with material recorded early in Harrison's post-Beatles solo career. While it doesn't include John Cusack and his boom box, this sprawling set includes pretty much everything else related to Gabriel's 1986 pop breakthrough. Along with a remastered version of the original record on both vinyl and CD, fans get a 1987 concert film, as well as the Classic Albums episode on the record, a live album, 60-page book and a double A-side twelve-inch featuring two unreleased tracks. Just in case you needed yet another Rolling Stones hits collection, the British rock mainstays have issued this latest compilation to coincide with the band's 50th anniversary. The super deluxe edition includes 80 tracks spread over four CDs, including a pair of new ones. Rounding out this massive set are two books, a seven-inch from a BBC Radio session, a disc of the band's previously unreleased first-ever studio recordings, as well as a collection of tour poster postcards. Sufjan Stevens once again offers up a collection of his Christmas compositions with Silver & Gold, instalments six through ten of his covers of Holiday classics and a host of original songs that embody the Christmas spirit. Guests include members of the National, Arcade Fire, and others, but the draw here is, as always, Stevens and his fractured, experimental takes on the almost unrecognizable standards. Still coming in the Exclaim! Holiday Gift Guide: the best gifts some of your favourite Canadian artists have ever received, and the ones they wish they were getting.